Mixed race dating usually refers to singles who are of a mixed race and not distinctly white, black, Asian, Latino and so on. They are both and share that race, ethnicity and heritage. Mixed race dating is certainly on the rise and according to some 2014 statistics, mixed race singles appear to fare better than “single race” individuals when it comes to dating. In fact, the majority of blacks, whites, Asians and Hispanics said that they would be more willing to date a mixed race partner than just a single race partner. Why? Some speculated that “part white” identity helps, though this is speculative. The truth seems more likely to be that mixed race skin is just a unique and beautiful trait that not everyone has. Diversity in race and dating interracially allows us to blend together and benefit from each other’s genetics when we have children. Obviously, there are advantages to mixed race dating. The gene pool is further diversified, which of course makes for some very cute babies! Beyond that, you may find that you admire the culture of your new partner, as well as their personality. Some people might even tell you that mixed race dating is a necessity, as the more mixed race couples have children, the more we will eventually get rid of racism; in theory, we would all be “mixed” and thus become one race. Besides, many of the best looking people in Hollywood happen to be of a mixed race, speaking of all your favorite superstars like Beyonce, Jessica Alba, Mariah Carey, The Rock Dwayne Johnson and Olivia Munn. That’s not to say that everything will end happily ever after. 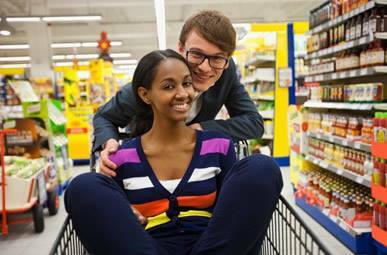 In addition to the typical relationship follies that everyone goes through, you may find that some people will still have a problem with the interracial aspect of your relationship. Family and friends may not approve of the two of you dating and this will certainly cause tension. Sometimes you may even people staring at you, making gestures or strange faces or other subtle behavior. It may not upset you but it could upset your partner. Sometimes people’s common rudeness (such as not saying hello) may even be taken by you or your partner as a racial insult. All of these problems are common in interracial or mixed race relationships. Remember that reassuring your partner is the most important thing. Don’t be neglectful of his or her feelings. But on the other hand, don’t always go looking for a fight. The more conflict you bring into arguments with family, friends or strangers, the more stress you will bring to your partner also. As much as possible, try to ignore people’s ignorance and negativity. If someone shows you that they just don’t understand something, then be patient and explain it to them. Sometimes the best way to eliminate bigotry is to educate people as to why you are in love with this person. Expressing your feelings honestly and openly, without censure, can be a great way to clear the air and improve relationships. Trying a mixed race relationship on interracial dating sites or offline can be exciting and can open your mind to new thoughts and experiences. Why not give it a shot and make this a year to remember?